Today is Day 2 in our Gut Health Series, and I'm thrilled to be sharing a few recipes over the course the week from three of my favorite "healthy belly" cookbooks. 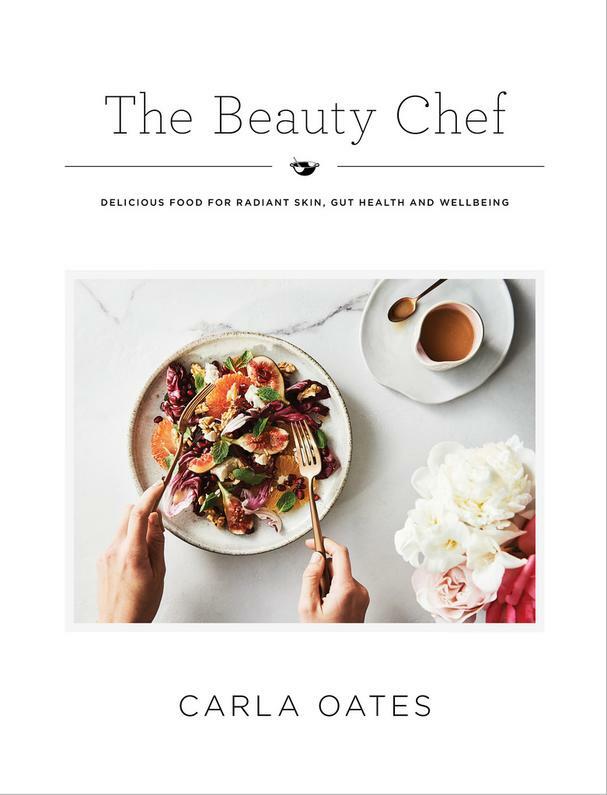 Today's feature is from The Beauty Chef: Delicious Food for Radiant Skin, Gut Health and Wellbeing, a gorgeous new cookbook from Carla Oates. Carla, founder and 'chef' behind the Australian beauty and wellness brand, The Beauty Chef, believes healthy, radiant skin comes from a well-balanced gut. In her newest cookbook, she marries the joy of cooking with the science of diet and offers facts about the best ingredients to feed and nurture our skin and our belly. The Beauty Chef contains over 150 delicious and nutritious dishes that are gluten-free and mostly dairy-free, and will leave you looking and feeling tip top inside and out. Carla also shares her personal story of dealing with eczema and allergies as a teen. She discusses the common causes of gut health issues (such as inflammation, grains, dairy, fats, and sugars), then goes on to share her Glowing Kitchen Tips, and Beauty Nutrients table which describes the health benefits of various nutrients and where to find them. The recipes in the cookbook range from family-friendly and healthy twists on classics to special occasion and traditional ferments, with chapters covering every meal of the day, including Baking, Drinks, Snacks, Sides, and Basics (covering fermentation, broths, cultured products, breads, wraps, sauces, and more). 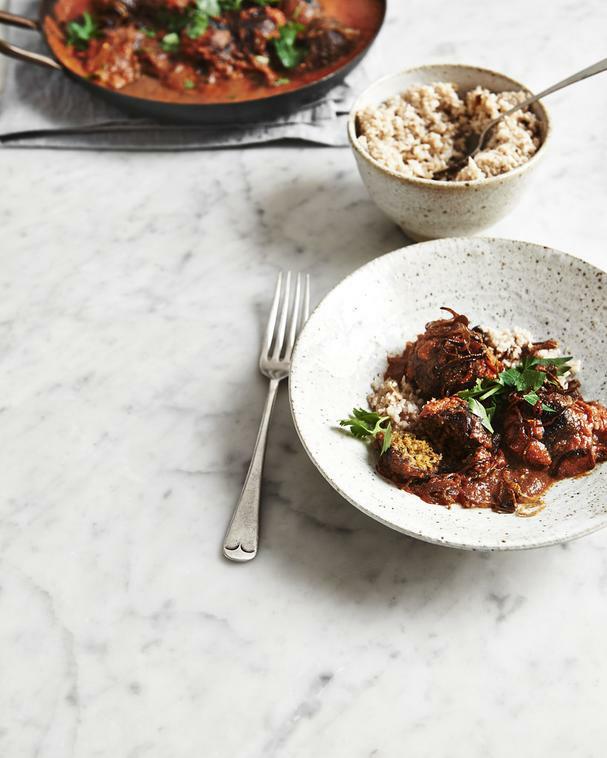 Carla says the following recipe is, "A beautifully fragrant and gratifying dish, rich in protein and good fats and spiced with ras el hanout and za’atar, both anti-inflammatory, antioxidant and digestion-promoting spices." Be sure to get yesterday's Gut Healthy Green Tea Shiitake Mushroom Miso Soup recipe from The Healing Slow Cooker cookbook here. To prepare the walnut and white bean balls, heat the oil in a medium frying pan over low heat. Cook the shallots and garlic until softened. Add the spices and cook until fragrant. Add the walnuts and cook until lightly toasted. Set aside to cool slightly. Transfer the walnut mixture into a food processor. Add the beans and herbs. Process to finely chop. Season. Shape into 20 walnut-sized balls. Heat half of the oil in a large frying pan over medium heat. Cook half of the walnut and bean balls for 4–5 minutes, turning frequently, until browned all over. Transfer onto a large plate and set aside. Repeat with the remaining oil and balls. To prepare the sauce, heat the oil in a large deep frying pan over low heat. Cook the garlic until softened. Add the paprika and cumin and cook until fragrant. Add the passata, water, yoghurt and maple syrup and bring to a simmer. Simmer over low–medium heat for 10 minutes. Season to taste. Add the browned walnut and bean balls to the sauce. Simmer for 5 minutes, or until heated through. Meanwhile, to prepare the fried onion, heat the oil in a medium frying pan over medium–high heat. Cook the onion until golden brown. Drain on kitchen paper. Meanwhile to prepare the cauliflower rice, place the cauliflower in a food processor and blend until finely chopped into rice-sized grains. Heat the ghee in a large frying pan over medium heat. Cook the flaked almonds until golden. Add the cauliflower and spices and cook, stirring occasionally, for 3–4 minutes, until cauliflower is just tender and heated through and spices are fragrant. Season with salt and pepper. Cover and keep warm. Serve walnut and bean balls with fragrant cauliflower rice, scattered with chopped herbs and fried onion. Recipe excerpted with permission from The Beauty Chef by Carla Oates, published by Hardie Grant Books August 2017.